(Feb. 23, 2017) The Portland Bureau of Transportation (PBOT) has launched Patch-a-thon, a new initiative to fill the numerous potholes caused by this season's many winter storms. As of Wednesday, PBOT had a backlog of more than 1,000 potholes that have been identified by residents and city crews. During Patch-a-thon, PBOT dedicates extra crews and resources to address the backlog. During normal operations, PBOT has two to three crews repairing potholes. During Patch-a-thon, this number will rise to 12 to 15 crews. Transportation Commissioner Dan Saltzman helped kick off the effort by helping a crew fill a pothole on Thursday. "PBOT crews worked through record snow and low temperatures this winter," Saltzman said. "Those winter storms left us with hundreds of potholes all over the city that residents are rightly concerned about. I encourage Portlanders to report potholes with as much detail as possible. And please be patient as we work through this backlog." The first two days of Patch-a-thon are Thursday, Feb. 23 and Friday, Feb. 24. In the coming weeks, PBOT will hold a Patch-a-thon on those days when the weather permits effective and safe pothole repair. PBOT will continue Patch-a-thon until the winter pothole backlog has been cleared. PBOT crews fill more than 8,000 potholes a year, working throughout the year. The work is weather dependent and crews are sometimes diverted to emergencies such as landslides. Heavy rain can cause potholes to fill with water, making the repairs less durable. Portlanders are encouraged to report potholes by sending a detailed description and photos to PBOT dispatchers by email pdxroads@portlandoregon.gov or by using the PDX Reporter App. They can also call 503-823-1700, PBOT's 24 hour maintenance line. PBOT has also published an interactive pothole map, so that Portlanders can track Patch-a-thon's progress. The map shows potholes reported since Dec. 1, 2016, showing the backlog created by winter storms and low temperatures. 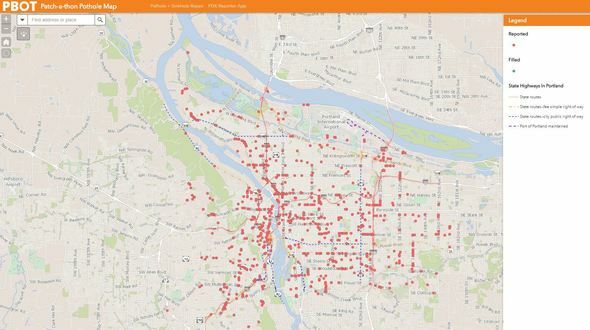 Visit http://arcg.is/2l9qAGt to view the Portland Patch-a-thon Pothole Map.